Vitis rotundifolia, unripe muscadines. Scuppernongs are muscadines that are bronzeish green, and dark muscadines start off green, as in the photo, and turn purple-black. What loves a hot, humid summer? Muscadines do. These rambling grape vines thrive in the Southern heat as no other grape will. They’re so full of vitality they can pull down mature trees. Truly, this is a plant with vigor. Actually, the muscadine is clever. 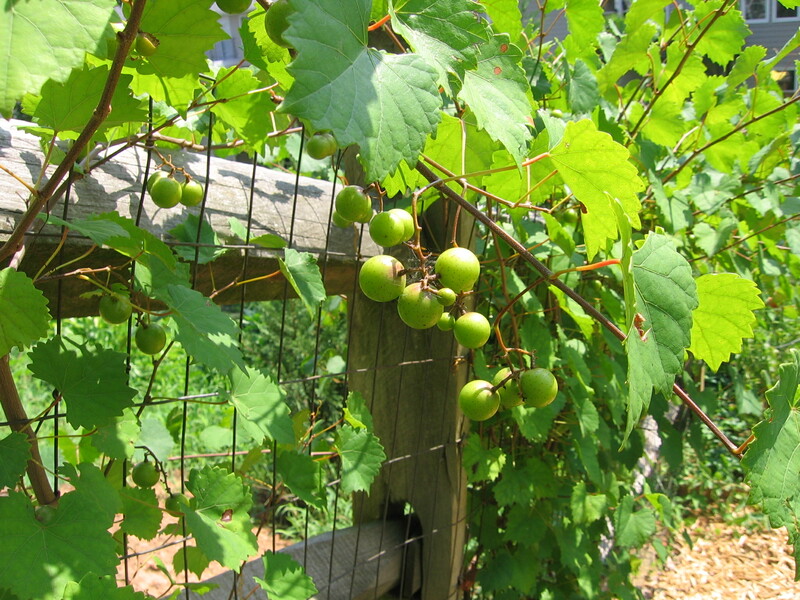 To propagate, the muscadine needs to produce fruit, which contain its seed, and it needs sunlight for maximum fruit production. Although it isn’t a climbing vine, like English ivy, it compensates for what it lacks. On the forest floor, where sunlight is at a premium, the young muscadines get friendly and hitch themselves to sapling trees. As the tree reaches to the light, the vine rides on its coattails, growing to match the rate of the tree’s speed of growth, so its roots aren’t pulled from the ground. Eventually, the great weight of the muscadine, thanks to its exposure to sunlight enabled by the tree, will take down its companion, finding itself back on the forest floor. The mother vine then will hope her progeny will meet and attach themselves to nice saplings so they can together ride to the light. Something we can learn from the muscadine (Vitis rotundifolia) is longevity, which we also might experience when we introduce muscadine grapes and leaves into our diet. Everyone’s heard about the benefits of red wine, with the goodies being in the skin. All berries that are red, blue, purple and black have anti-aging polyphenolic flavonoid compounds called anthocyanins. The black-purple berries of the native Southeastern muscadine vine have more anthocyanins than any European grape. The bronze-colored muscadines are called scuppernongs, and have less anthocyanins, than the black. Besides anthocyanins, other polyphenols in muscadine, such as ellagic acid, maintain health for every part of the body by a protecting gene expression and inhibiting cellular damage from free radicals. Increased immune, heart and brain function and decreased inflammation contributing to cancer development are some of the remarkable, longevity-promoting effects of muscadines. Muscadines have been cultivated in the South since the 16th century, and they’re also invasively abundant. It’s a puzzler why this grape isn’t more popular. University of Georgia researchers at the Nutraceutical Research Laboratory are working to promote Georgia’s agricultural crop of muscadines for export, providing research that the muscadine is more potent in antioxidants than the high-priced, imported, exotic Acai berry. Value-added muscadine products, such as wines, jams and juices, will increasingly find a market. Entrepreneurial community gardens might cooperatively find a boost by cultivating muscadines as produce and for value-added products. The grapes, which have a tough skin and tolerate the Georgia climate, have a long shelf life, and ship well. Growers need to know that nonhybridized varieties require a male and female vine to produce fruit. The leaves also contain polyphenols and make a delicious, locavore substitute for Greek stuffed grape leaves, known as dolmas. Harvest 20 to 30 of the largest muscadine leaves, brine them, stuff with a millet-raisin mixture, roll and steam, and you have healthy hors d’oeuvres. Recipe for stuffed muscadine leaves. Based on a recipe from Wildman Steve Brill. Pick 30 of the largest and prettiest muscadine leaves you can find. Rinse them well. Cut off the stems. Brine them for a few minutes in 2 quarts of boiling water with 2 tablespoons of sea salt. Drain, and then rinse them again in cold water. Set them aside. Stuffing: Mix together 2 cups of cooked millet or brown rice; 1 cup of feta; 1/2 cup of raisins chopped into smaller pieces; 2 tablespoons of chopped green onions; 2 tablespoons of parsley; 2 tablespoons of chopped walnuts (excellent ingredient); 1 teaspoon of rosemary; 1/2 teaspoon of paprika and sage; 1/2 teaspoon of salt; a 1/4 teaspoon of cayenne. To stuff the leaves begin with the stem side toward you. Put a small spoonful in the center of the leaf. Shape the stuffing into a inch & a half log going across the leaf. Fold the right and left sides of the leaf over the stuffing. Roll the stem-side over the stuffing until it meets the tip of the leaf. Spear them through the middle with toothpicks. Steam them in a large enamel pot. Add 4 cups of stock or water to the pot, 8 cloves of peeled garlic, and chopped ginger. Find a steaming basket or shelf to place the stuffed muscadines on. Steam for 30-40 minutes. You could cook in a large skillet on the stove top, or bake them in a casserole dish. In both cases you would add the stock or water to the cookware. Make the sauce in a blender with 1/4 c almonds, 1/2 cup water, 1/4 c tahini, 1 tablespoon of fresh ginger; 6 cloves of peeled garlic. Spoon over the rolls after they are on a buffet platter or served on a plate. 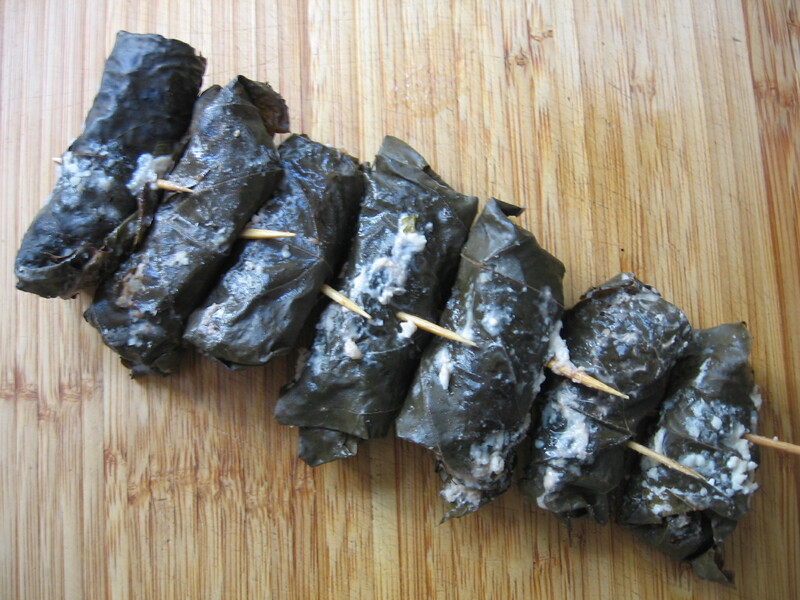 These stuffed muscadine leaves (dolmas) are really good. They were a hit at my last herb walk and wild foods lunch. Don’t expect them to taste the same as Falafel King’s, though, which are a delicacy. The way they are made is different. Let me know if you make this. This article originally appeared in my Sunday Urban Forager column of the Athens Banner-Herald, August 15, 2010.